The Bucks have lost 10 of 12 to drop to 7-26 overall following Saturday's outcome. Mayo called the run-in "a little Kumbaya moment." "It is team bonding," he said. "There are different ways you go about it. It is an emotional roller coaster. When things aren’t going well, that is when the real men reveal their true colors." NOTES: The Bucks, who have used 15 different starting lineups this season, had the same one for the third straight game. … Phoenix leaves Monday for a five-game road trip, beginning Tuesday night in Chicago. 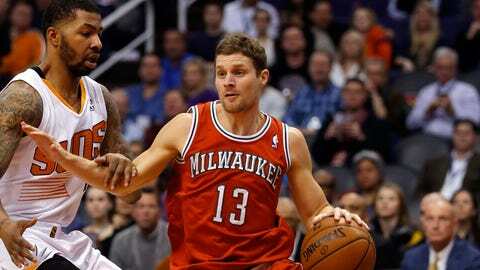 … Phoenix is 19-1 against Milwaukee at US Airways Center. Last season, the Bucks won to snap a 24-game losing streak in Phoenix.